Why does my Mailing List Subscription Button Generate a "403 - Forbidden" Error Message? Your subscription form's submit button needs to be changed to include your store's absolute and https path. 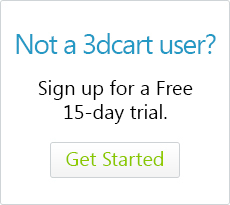 This is something that is most typically caused when the 3dcart Newsletter Subscription form is moved from its default location to a different area of the store. By default, your store's Subscribe to the Mailing List function is located on either the left or right banners of your store's frame. As such, it has special coding on it to prevent the 403 error from occurring. However, some merchants may want the subcription submittal form relocated to a separate section of the store such as the My Account Page or perhaps a more prominent location such as the home page. This can generally be done by copying the <!--START: FRAME_MAILLIST--> to <!--END: FRAME_MAILLIST--> code present on your store's frame.html file; then applying it to whatever other page you'd like. However, in order to avoid the 403 error, you will need to change one small aspect of the form code. Please note that 3dcart support representatives are neither qualified nor trained to provide HTML editing support, and will not be able to assist with the above edits to your page(s).